It's kind of an automation workflow, but for example you can set up a popup to appear at a specific time on a specific product page and offer the visitor something. The visitor then signs up and then (after you've set up your automation sequence) that visitor gets a specific welcome page based on the popup they signed up through, and then a specific order confirmation email and everything else flows from that specific popup. That's great because it's allowed us to sort of fine-tune our offerings to get our visitors' emails in the first place and offer, for example, someone browsing a product page for 3 minutes something different than someone staying 20 seconds on the homepage and then leaving. Newsletter campaigns - the content editor is the usual one you see on email marketing apps, but it works so smoothly and well. 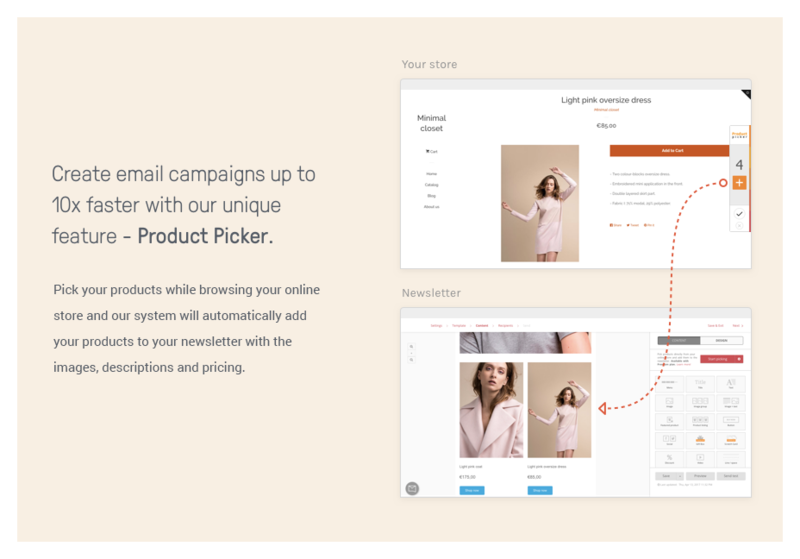 Of course, there's Product Picker that allows you to just pick a product from your store and it goes straight into your newsletter--no need to add images or descriptions. Really easy. Popups are great because they look amazing right out of the box. It's all pre-filled so if you don't like looking at a blank screen, you can just adapt the wording and it's there. voila! Automation really is nice and it's the bulk of what we're doing now. It's like second level ecommerce marketing I guess, because you really see after some time how having automated steps can really save you time and make you a lot more money. Omnisend's automations are really good and intuitive and was really easy to learn and implement. They've recently updated their Segmentation features and at first I was confused by it, but now I see where the misunderstanding came from. I think that when I found what I was looking for, I saw it was actually better than I wanted. So I guess one con for me was just a little lack of clear communication or explanation on their part. They are the best! USA number, team in Cali, helps you out right then and there or goes and figures out how. Always follows up within 24hrs if they have to seek out the answer. ROI has gone up when compared to other email marketing. Our open rates have increased and naturally also our conversion rates. Both in absolute and percentage terms. I don't have hard figures with me, but I'd say we've almost doubled what we've done with other email marketing apps.